Jacksonville, FL -- The Mississippi Braves (37-30, 66-71) were eliminated from playoff contention on Saturday despite a doubleheader split with the Jacksonville Jumbo Shrimp (27-41, 55-81) at The Baseball Grounds of Jacksonville. 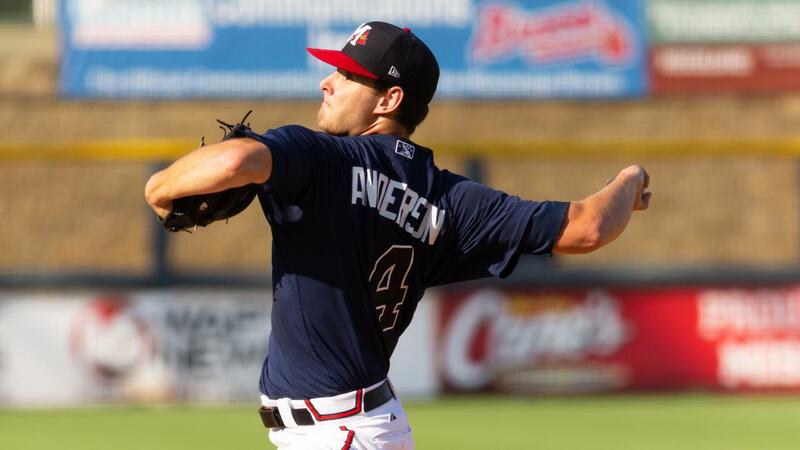 M-Braves pitchers allowed just one run in 13 innings, including a 10-strikeout performance from Ian Anderson in game one. The M-Braves won game one, 3-0 and dropped the nightcap, 1-0. The game two loss, paired with wins by both Pensacola and Biloxi ended Mississippi's chances of making the postseason for the first time since 2016. Saturday's contests ended a stretch of playing five games in three days at Jacksonville, finishing 3-2. The clubs will have Sunday off due to a Lynyrd Skynyrd concert, and then conclude the six-game series on Monday at 1:05 pm CT.
Anderson (W, 2-1) took the ball in game one and was brilliant in his fourth Double-outing. The third overall selection in 2016 by the Atlanta Braves reached double-digit strikeouts for the third time in his career, fanning 10 over 6.0 shutout innings and walking just two. Anderson finished his 2018 regular season with back-to-back shutout performances over 12.2 innings on just five hits with 19 strikeouts and three walks. The offense supplied Anderson a lead in the third inning. Ray-Patrick Didder reached on a single and moved to second base on a throwing error by Jacksonville starter Dustin Beggs (L, 1-2). Anderson bounced out to first, pushing Didder to third base, setting up an Alejandro Salazar RBI single. The M-Braves took that 1-0 lead into the seventh inning and added on a pair of insurance runs. Daniel Lockhart and Jonathan Morales reached with singles to start the frame and each advanced on a groundout by Didder. Pinch-hitter Luis Valenzuela drove in both runs with a single to right-center and it was 3-0 M-Braves. Thomas Burrows (S, 5) has been virtually unhittable out of the Mississippi bullpen and the lefty took over for Anderson in the seventh. The Alabama all-time saves leader gave up a two-out single, but struck out the side, earning the save, and pushed his scoreless innings streak to 11.1 innings. The win in game one pulled the M-Braves to within 1.5 games of division-leading Biloxi and alive in the playoff race. Game two picked up where the first left off with starter Ricardo Sanchez throwing up zeroes. Sanchez pitched 4.0 scoreless innings on just two hits with three walks and four strikeouts in his final start of the season. Sanchez ends his season by giving up just three runs over his final four outings and 21.0 innings pitched, 19 strikeouts and four walks. The M-Braves threatened to score in the top of the fifth inning and Tyler Neslony pinch-hit for Sanchez, ending his outing prematurely. Justin Kelly tossed a scoreless and fifth inning to preserve the scoreless game. Jason Hursh (L, 0-1) took over in the bottom of the sixth inning and allowed a leadoff single by John Norwood. Hursh got Brian Schales for the first out when he popped up a bunt and John Silviano reached on a fielders choice. Rodrigo Vigil bounced the only extra-base hit of the doubleheader, a double just fair down the third base line and Silviano scored all the way from first base giving the Shrimp a 1-0 lead. Dugger hurled a 1-2-3 inning in the seventh finishing off the complete game shutout, surrendering just one hit and saddling the M-Braves with a 1-0 loss. The M-Braves and Jumbo Shrimp will enjoy a day off on Sunday and then finish off the 2018 regular season on Monday afternoon at The Baseball Grounds of Jacksonville. RHP Enderson Franco (5-9, 4.04) makes the start for Mississippi against RHP Cody Poteet (3-11, 5.24) for the Jumbo Shrimp. First pitch is set for 1:05 pm CT with coverage beginning at 12:55 pm on 103.9 WYAB, TuneIn Radio, and MiLB.TV.